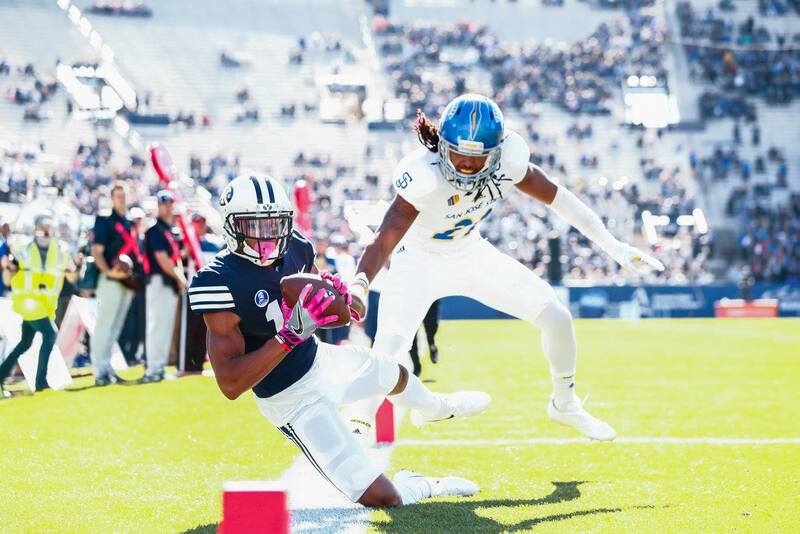 PROVO – Tanner Mangum, KJ Hall and Micah Simon helped BYU to a 41-20 win over San José State Saturday afternoon at LaVell Edwards Stadium. Mangum completed 18 of 34 passes for 283 yards and three touchdowns. It marked his first three-touchdown game since 2015. Hall rushed for 112 yards and a touchdown. He also caught three passes for 44 yards. His 75-yard touchdown run in the second quarter was the Cougars’ longest rushing play since Mike Hague’s 87-yarder against UNLV in 2006. Simon became the first BYU player with two touchdowns in a single game this season, as he reeled in touchdown passes in the first and fourth quarters. On defense, the Cougars forced five turnovers. Brayden El-Bakri, Zayne Anderson, Austin Lee and Langi Tuifua all recovered fumbles, while Michael Shelton picked off a pass. BYU’s first drive went 85 yards on five plays for a touchdown. Jonah Trinnaman caught a 45-yard pass from Mangum on the Cougars’ first offensive play. Mangum connected with Simon for 23-yard touchdown four plays later. BYU led 7-0 five minutes into the game. On the ensuing kickoff, El-Bakri forced and recovered a San Jose State fumble on the Spartan 10-yardline. Mangum found Matt Bushman for an 11-yard touchdown pass over the middle and the Cougars extended their lead to 14-0. San Jose State got on the board with six minutes left in the first quarter when Bryce Crawford hit a 48-yard field goal. Crawford provided the game’s next points early in the second quarter, with a 25-yard field goal to cut the BYU lead to 14-6. On just the second play of the Cougars’ next drive, Hall made it 21-6 with the 75-yard touchdown run. Rhett Almond made a 36-yard field goal with 5:09 left in the first half for a 24-6 Cougar lead, which they took into the locker room. Squally Canada’s nine-yard touchdown run 10 minutes into the third quarter gave BYU a 31-6 lead. Mangum completed a 42-yard pass to Aleva Hifo to set up the score. On the first play of the fourth quarter, Mangum found Simon for a 41-yard touchdown pass down the left sideline. The Cougar lead increased to 38-6, and it was added to three minutes later with a 30-yard Almond field goal. The Spartans scored their first touchdown halfway through the fourth quarter. Montel Aaron connected with Tre Walker for a 30-yard touchdown pass to put the score at 41-13. With less than a minute to play, San José State scored again, with Aaron hooking up with Tre Hartley for a nine-yard score. BYU plays on the road against Fresno State next Saturday at 7:45 p.m. PDT. That game will be televised on ESPN2, with radio broadcasts on BYU Radio (Sirius XM 143) and KSL 1160 AM/102.7 FM. 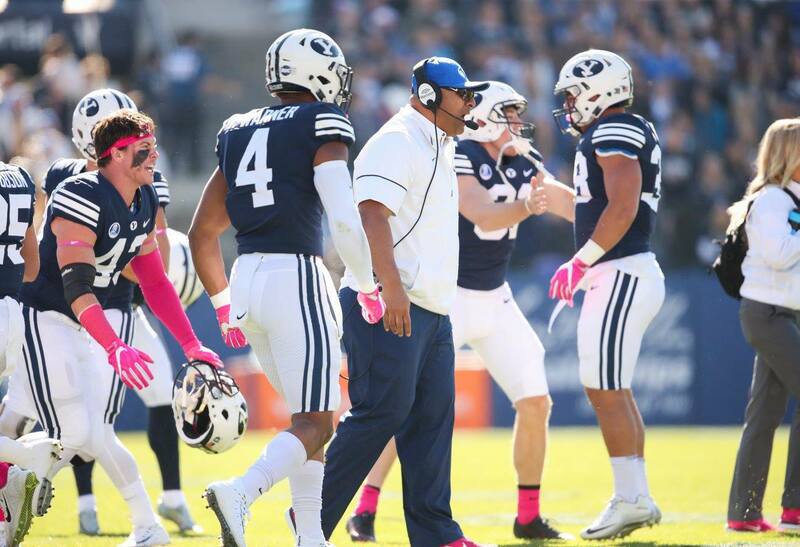 Offense missing in action again as BYU falls to Boise St.